(CNS): The first new classroom block in the government’s renovation and expansion of public primary schools opened last week at George Town Primary, much to the delight of teachers, students, parents and politicians. Education Minister Rolston Anglin said that, given the economy constraints on government, the decision to renovated rather than build new schools presented a practical approach to overcrowding and facility shortages in many of the islands' primary schools. With nine classrooms, each with smart boards, a library and music room, the new block brings much needed modern learning space for the young students. The block which was demolished at the school to make way for the new classroom building was more than 50 years old and the school had also suffered in the wake of Hurricane Ivan in 2004. 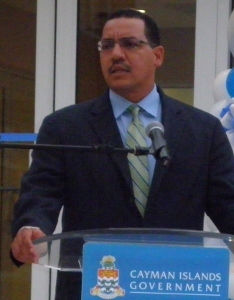 Anglin said that when he became minister and began his tour of all of government’s schools, the first and last questions asked by teachers and parents at the George Town primary was “When are we getting a new school?” This was not surprising, Anglin said, because it was apparent the school was in desperate need of investment. “It became obvious to me that we had to invest in infrastructure at the primary schools,” he said. Government, however, was not in any position to build a new school, so the decision to renovate on the school sites rather than trying to build new schools was seen as an immediate solution to the problem, the minister explained. “We had to think how we could deal within the financial realities and at the same time deal with the needs of the children,” Anglin said at the opening ceremony on Thursday evening. He said the ministry went back to basics and thought about practical and sensible solutions. “We went to the drawing board and came up with a plan that would revolutionize the school,” he said. He said it was about finding solutions that wouldn’t mortgage the country’s future or make promises that couldn’t be kept, as he took aim at the previous minister’s decision to build two brand new high schools that the current government says the Cayman Islands cannot afford. Anglin said he was looking for equity across the system and the result was a first rate school building by any standards and a solution to the schools problems, delivered in a cost effective way. He saidthe building would allow teachers at George Town Primary to deliver the highest quality of learning. “Every single classroom in this facility has a smart board,” he said, adding that what teachers can do with such tools is transformative. “We were able to deliver what our children deserve." He said schools were about learning and there had to be first rate learning in schools, which had to be delivered by competent teachers. He said that under the principal, Maria Martin, the school would continue to get first rate learning. Martin welcomed the school block and said she had not believed she would ever see the day. “No better investment can be made than in education,” the school head noted. George Town Primary is the first of a number of primary schools where renovations are underway, with West Bay, Bidden Town and Savannah primary schools all due to have new blocks opening shortly. Was this photo taken before or after the 'Likkle' problem? Not sure but he is holding onto that podium for all it’s worth. You know what instead of throwing all this money into building schools, rebuilding schools why don't we start subsiding private schools for Caymanians? Be nice to get a discount for our children going to private schools and all of our kids can benefit from a great education insted of the government throwing money down the toilet for a lost cause. This is Cayman and that is what (we) CAYMANIANS love to do! A whole country full of hypocrites. When do the AA classes/meetings start? Miss Martin deserves the highest honours that can be given to a living human being. She is already a national hero who has given everything for love of the children; for love of the school and for love of this country. Mr. Minister, now on to the Awards presentation. This was a tragedy the previous and present government could have avoided. If government from the start was more fiscally responsible with its finances, no doubt, the funding that was needed to renovate these schools and add classrooms would have been readily available. That is why so many oppose the idea of a compulsory system of government-run education. If from the start, a free market in education that begins with the responsibilities of parents to provide for their children's education, was promoted and not hindered by government regulations and policies, schools like Triple C School, Truth for Youth, etc…. would have been upgraded to colleges from long time. ICCI would have been University status from long time. Cayman would have had an array of institutions competing for a well educated student body, renown status, and prestiged. Excuse Libs exaggeration "long time", but I understand him fully that we would have been better off. As the parent of a GTPS child who was being bussed every day from GTPS to Elmslie Memorial Church (GTPS was using their hall as classrooms because NO SPACE at GTPS since one block of classrooms was demolished to make way for the new building), I and my daughter are very very happy to be back at GTPS. She is now in the new building andloves it. Miss Martin – you are fantastic, we love you and are so happy that at least part of the school is now brand new. Now, to get rid of those trailers by the basketball court and build another proper school building!!! Where is John and Truman (as a past Education Minister) to chime in on spending of Rollie? John and Truman speak of Arden judgement in not clearing up past road debts before beginning new roads and incurring new/more Govt debts. What do they have to say about Rollie not completing the JG High School and the Clifton Hunter high School BEFORE running off and starting work on the primary schools? Also, the article speaks of school buildings over fifty years old. My question for Truman is: Why were the buildings not updated during his time as Education Minister and then Leader of Government Business? How many years did John and Truman serve in ExCo with little to nothing done to infrastructure? It took Roy to begin increasing schools infrastructure in Grand Cayman. I am happy to see the George Town Primary children receiving help. So 50 years ago, when we knew who the principals of of schools were (Teacher McField, Rev. John Grey, Ms. Joanna Clarke to name a few), when we knew who the Chief Education Officer was (Mrs Islay Connolly) and when we didn't have "ministers of education", we built schools WITHOUT mortgaging the country's future!! tell us what he was doing to ensure that those funding arrangements were institutionalised so that going forward, we would not be needing to face these challenging issues about the well-being of our greatest asset – our children. But in stead we get more of what we have all become so used to hearing, and in my case so fed up of hearing, how he is smarter than the former minister and took better decisions than the former minister did!! Since Mr Benson left office in 1992, we have had this egotistical and disgusting parade of Members/Ministers of Education each trying to show that they were smarter than their predecessor. Mr Truman had to show that he was smarter than Mr Benson, Mr Roy had to show that he was smarter than Mr Truman, Mr Alden had to show that he was smarter than Mr Roy, and now Mr Anglin has to show that he is smarter than Mr Alden!! I thought that Rundown's depiction of Minister Anglin and his Chief Officer was so spot on this year – her unadulterated commitment to try to make him look like the greatest Caymanin ever! who is the principal of John Grey High School, George Hicks or Clifton Hunter as its now called, West Bay Primary (since the article above says who is the principal of Gerrge Town Primary) and Savannah Primary? who is the Chief Education Officer and what is that person responsible for? And when is the last time you saw a story in the media about a young Caymanian who has chosen teaching as a career and is making a difference in our education system? Here was the opportunity for the Minster to preach the virtues of proper fiscal management – of depreciation accounts that accumulate replacement expenses for assets like the school block at GT Primary that had to be demolished, for capital expansion funds becasue the school population hasbeen growing and is expected to contiue to grow at whatever rate. The real sad part is that this campaign has been facilitated by a relentless pursuit to make more and more things "free" – justified under this notion that the government is obligated to provide free education. In reality, what we have today is education being provided free FOR VOTING PARENTS but AT THE EXPENSE OF the children themselves. When the government raises $230M in a bond that it pays only interest on for the next 15 years AND has made no arrangement to set set aside $230M to pay that bond off when it comes due in 15 years time, who will have to pay it? The children in George Town Primary who are between the ages of 5 and 10 today and will be adults between the ages of 20 and 25 in 15 years time, that's who!!! Sorry Mnister Anglin, I expected better. Good post, but PLEASE pay the good late Rev. John Gray the correct spelling of his name. It never ever was Grey. When we don't have the money to finish the high schools, where does the money come from to do this? Isn't this just another political football? Pretty fancy building an equipment from the man who as recently as last election said children could learn under trees. When are the high schools opening Rollie? Why would anyone give thumbs down to this question? Do you NOT want the High schools finished? It’s this kind of backwards thinking that necessitated the building of new schools. It will soon be at capacity. Then what? Ps. Someone was willing to build the whole school, at their expense. Why not tell the parents what became of those plans? Where are they finding the money? Aren't we bankrupt? Or was that just a UDP political story? It is funny how it was so wrong to try & build the GT primary school under the PPM yet the UDP feel it is the right thing to do now that they are the government. I agree with them, it should be built or rebuilt, but why did they constantly say it was wrong of the PPM to do it, yet the economy is worse now? Oh, my bad, that is just the UDP way! DIRTY POLITICS & untruths! I suspect the answer will be told when we get the answer as to the 2008-2009 audited Govt financial accounts. Why did they not want to audit that year again? FINALLY, a big thank you to all involved 🙂 And a special congrats to the hardest working School Principal in the history of Cayman Islands Education. Go Miss Martin, your hardwork is appreciated. Regardless of how we wish to politicize this let us not deflect too much from the real issue. The George Town Primary School was in desperate need of new facilities. The former minister spent as much on acquiring a piece of property and the marl to fill it,. as was spent to make this building a reality. The students at GTPS are made to feel that they are not deserving simply because they are from the lower socio-economic layers of our community. However, that has changed in case you have nbot been keeping up. Doctors and lawyers, as well as accountants and teachers are sending their children to that school. That is due in large part to the Principal's (Miss Marie Martin) devotion, dedication, hard work and love for the school.